「立ちたさ＿」の活動や周辺のモロモロをご紹介するブログです。 The performance, Ta chi ta sa_ means “the urge to stand up,” the basic concept of which is　“Why does a human body apt to be Vertical like a line? “ I named it Ta chi ta sa_ that the act of carefully tracing my urge to come to a standing position from a lying position,　and performed and recorded this act in various environments including nature. Cathedra at an art space in Basel. Newman has visited Basel, and Kunstmuseum Basel owns several of his works and relatively many number of drawings and prints. It’s a rare and important museum among those in Europe, far away from the American-based Newman who didn’t pro- duce many works. In 2016, it held an exhibition curated by Dr. Anita Haldmann.Currently, in the exhibition room of this museum, two incredibly long and long work pieces "White Fire IV" and "Day Before One" are displayed side by side.The space in front of the two works contrasting in color and composition, I entered in the middle, how can I stand? How do the strong vertical lines of the painting twice my height and of my body line up once I come to standing after several dozen minutes in my work, Ta chi ta sa ? How do the horizontal lines, for example of the floors that I rely on, work against them? I will take on this challenge seriously. 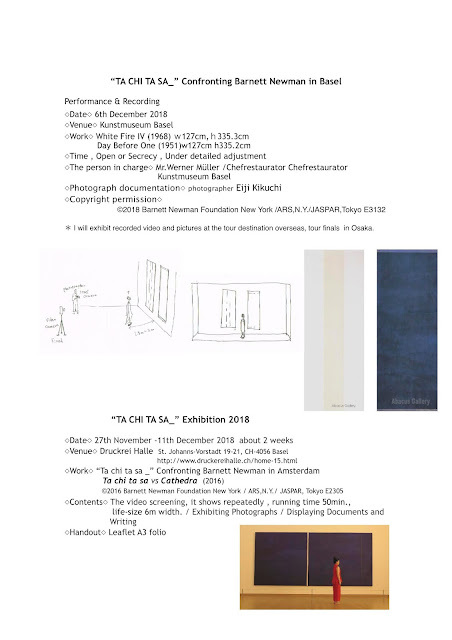 In the exhibition, I will present my work, Ta chi ta sa vs Cathedra. Same as the Tokyo exhibition, it will mainly consist of a video showing and display of photos and documents of how the work took shape. Stedelijk Museum Amsterdam was one of the first museums in Europe that purchased American contemporary art works. Cathedra is a masterpiece that was painted during the height of Newman’s exploration of new paintings. It’s also a work that has a sad past, having been once damaged with a knife. The video was recorded when I performed in front of the Cathedra with a red costume attentively. My series, Ta chi ta sa, would not have been created without the artist Newman and his work, which would not have been created if he were from Europe. My goal is to have Europeans with a longer and deeper arts tradition and people of Basel who are familiar with Newman’s work watch my performance. I am highly interested in what they feel and see from the performance.